Morning Fun Camp: Now registering! Click here to download a registration packet. 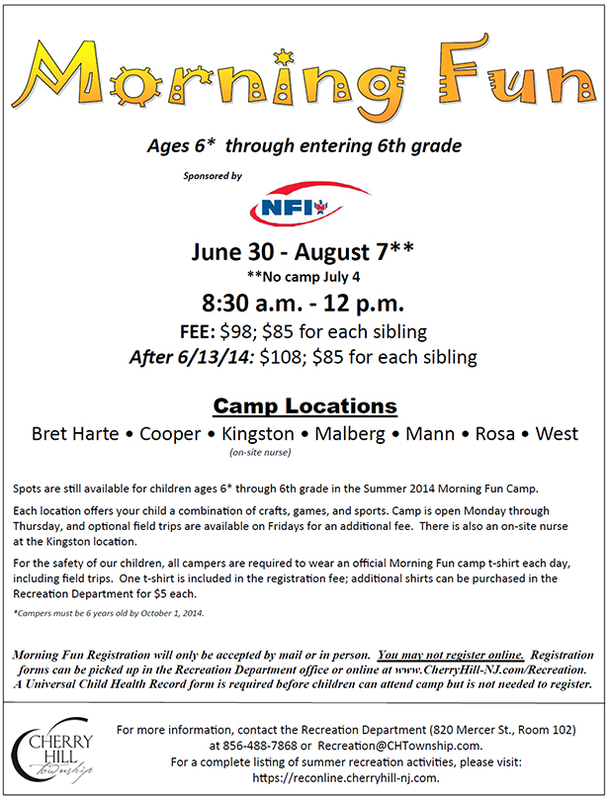 Spots are still available for children ages 6* through 6th grade in the Summer 2014 Morning Fun Camp. Each location offers your child a combination of crafts, games and sports. Camp is open Monday through Thursday, and optional field trips are available on Fridays for an additional fee. There is also an on-site nurse at the Kingston location. For the safety of our children, all campers are required to wear an official Morning Fun camp t-shirt each day, including field trips. One t-shirt is included in the registration fee; additional shirts can be purchased in the Recreation Department for $5 each. *Campers must be 6 years old by October 1, 2014. Moring Fun Registration will only be accepted by mail or in person. You may not register online. Registration forms can be picked up in the Recreation Department office or online at www.CherryHill-NJ.com/Recreation. A Universal Child Health Record form is required before children can attend camp but is not needed to register. For more information, contact the Recreation Department (820 Mercer St., Room 102) at 856-488-7868 or Recreation@CHTownship.com.